Ah, after about 5 days of me having to miss the nightly demos in Montreal — because I had to catch up on my freelance wage work — what a lovely way to return! 1. Five hours in the streets, always illegally, starting with a tiny casseroles in Mile End, my temporary home for a couple weeks. It was just one part of “the Casseroles Are Going Downtown!” Neighborhoods & neighborhood assemblies, with their pots & spoons (& hopefully a newly formed “people’s orchestra” springing from the first Mile End Neighborhood Assembly two days ago), decided to march, make noise, and illegally wind their way to Gamelin Park to join up with the equally illegal night (61) demonstration–for more marching & more noise in another defiant display that maple summer is alive & well. 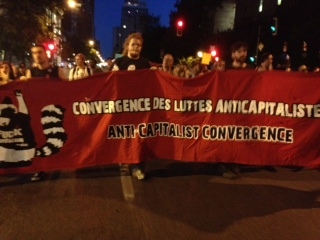 Some of the convergence points this evening were: 6:30 pm at the corner of Jarry & St-Denis, 7 pm at Beaubien & St-Denis, 7:15 pm at St. Viateur & Waverly (where I joined in), and 7:45 pm at Laurier & St-Denis. 2. So yes indeed, walking to converge here & there with other casseroles, we headed downtown, growing in noise and numbers, increasingly (like all casseroles) drawing people out on to their balconies, out their doors, looking up from cafes, etc., to wave, bang pots in solidarity, and otherwise show their support. 3. Unlike any other of the casseroles, though, this one unexpectedly stopped for a short direct-action swarm of casserolers to rush into a Renaud-Bray, which describes itself as ” the Largest Network of Francophone bookstores in North America,” because apparently its commitment to, again in its own words, “friendly meetings, discussions, and discovery” doesn’t apply to its employees if they wear a red square. 4. 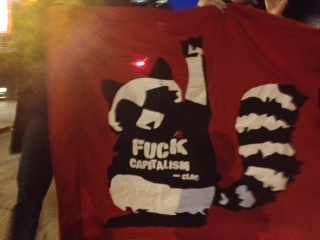 Onward from there, we continued walking as we wished against traffic, in the streets, to Gamelin Park next to Berri-UQAM Metro stop for the 8:30 pm nocturnal manif. Finding many more comrades awaiting us at the night demo 61 now-usual meeting spot, we quickly retook the streets in even larger numbers, not even giving the police time to drive their van up for the now-usual loudspeaker announcement that we’re illegal, they are here for our protection, we shouldn’t do this, that, and the other. Humorously, they tried amplifying that same message while following us from behind–almost visual acknowledgment of how the people are leading, and the police can’t figure out how to catch up or gain control. Hi Cindy — I’ve been trying to get someone to reply to me for awhile about the Lexicon series pamphlets that were funded through kickstarter and no one has contacted me. Here are my comments — can you contact me and let me know what is going on? Sorry! Please email me about it: cbmilstein@yahoo.com. This entry was posted on June 24, 2012 by Cindy Milstein in Dispatches from Quebec Spring.